Growing affordable access to Information and Communication Technologies have seriously questioned the need for telecentres in recent years (read telecentres as any kind of public access points, from libraries to cybercafes). After some times of hesitation, it does seem to be an increasing agreement that, far from becoming useless, telecentres are serving a second wave of citizen needs related to accessing ICTs. Thus, the provision of digital literacy and digital skills to fight a second level digital divide, and the provision of relevant content and services are displacing what before was the domain of (mere) physical access to technology. It seems just natural to think that if the goals and means of the telecentre change, so should its organization. Being part of and contribute to a network or series of networks. Establishing win-win partnerships with other agents (public and/or private). Let’s state the fact that every telecentre is a world, as it needs to adapt itself to the community it is embedded on: culture, socioeconomic profiles, social and individual needs, etc. all determine (or should determine) what the telecentre does and what the telecentre is. 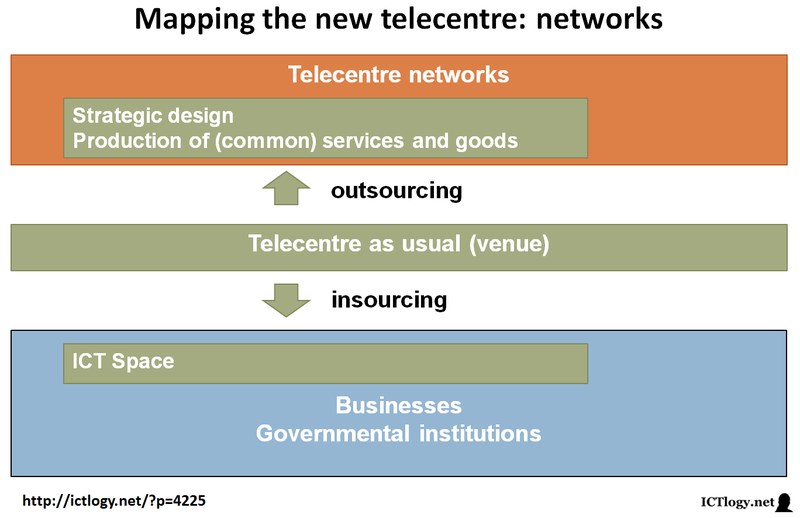 Nevertheless, there are several aspects of a telecentre that do scale: creating some generic or basic content, some certain solutions that can be easily adapted, some managing stuff… There is quite some evidence that telecentres that belong to a network have a higher probability of surviving in the long run. For instance, by outsourcing (some) telecentre administration and thus diminishing some costs. But networks are not only made of similar institutions: there may be institutions that could benefit from the telecentre’s knowledge but that will never approach their venue. Insourcing telecentres into organizations creating into them ICT centres managed by the telecentre is another way to gaining both sustainability and meaning by beig part of a network. Many institutions need to boost their services and content in a digital and online way; many telecentres, with a strong presence in a digital or online world need relevant services and content in which to embed training on digital competences and skills. It just looks natural that a partnership will be highly valuable for everyone’s purposes. Partnerships with governments in the field of e-government or ICTs and education, or partnerships with the private sector in the field of e-commerce or strategic consultancy can be good places where to begin. More important, indeed, these partnerships can provide a mix of not-for profit or subsidised and for-profit activity, depending on the target user, the nature and goals of the partnership, etc. Telecentres should not avoid charging for some services (many already do) with the idea of providing a wide range of products, letting the user to chose what and how much — instead of the telecentre deciding for the user. It is common knowledge that the telecentre should adapt itself to the place where it is based. And it is also common knowledge in development studies that there is no sustainable development if it is not endogenous, that it, if it not build upon a community — or builds a community, and empowered one. But there are several ways to do so. Networks and partnerships are a part of it. But it kind of is doing things from the outside: what telecentres would surely need — and libraries, and schools, and civic centres, and… — is being the community, that is, not helping others, but being themselves. It is not usually so: when we speak about e-inclusion we still see it with split roles: telecentres and ICTs on the one hand, the rest of the community on the other one. Working together, yes, but not merged one with another. I believe that we should shift from the ICT Centre to the Centre-with-ICTs. Civic centres (with a normalized use of ICTs) and schools (with a normalized use of ICTs) are good examples of community based “centers-with-ICTs”. Of course, teachers would perform one role, and telecentre staff another one, but the important thing is that everyone believes that there is not such a thing as telecentre staff embedded in the school, but people working for education with the help of ICTs. Living labs (with a normalized use of ICTs) and centres or communities for social entrepreneurship (with a normalized use of ICTs) are other centers-with-ICTs, this time based on local entrepreneurs. Here is where the telecentre becomes a virtual telecentre: has the functions and roles of a traditional telecentre, operates in a network of virtual telecenters, and outsources much of its administration (to the network or to the hosting institution), thus being able to concentrate on its specific tasks and goals. But it does not any more rely or focus on physical access to technology. It’s the function, not the place, what’s in its name. 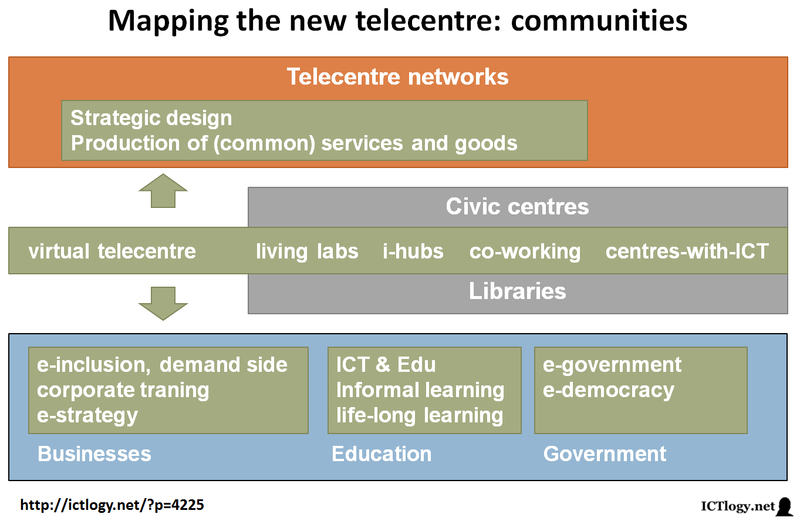 Originally to be published on September 3, 2014, as Mapping the New Telecentre at Telecentre.org’s Expert Corner. A Spanish version of this article has also been published as Mapeando el nuevo telecentro. All the articles published in that blog can also be accessed here. Peña-López, I. 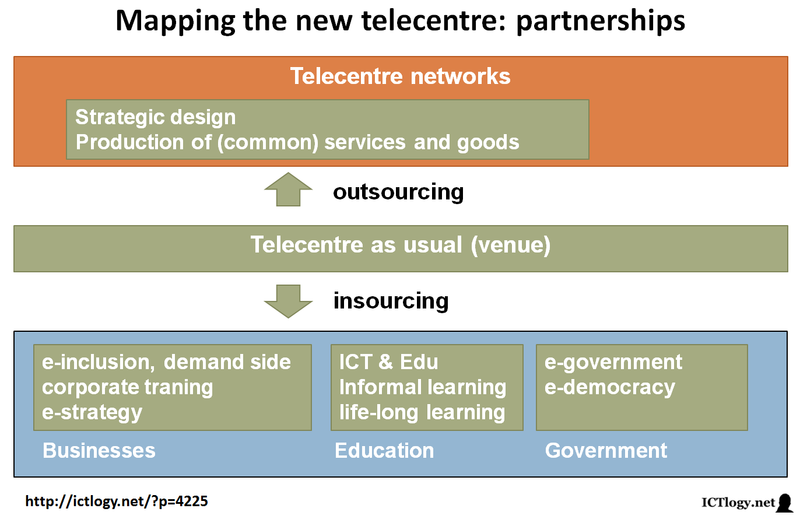 (2014) “Mapping the new telecentre” In ICTlogy, #131, August 2014. Barcelona: ICTlogy.